Are you looking for information on The Fallen Star conversation with Covetous Shen? Kill the risen dead attacking the gates. Talk to Leah in the Slaughtered Calf Inn. Talk to Captain Rumford at the gate to New Tristram. Kill the Wretched Queen in The Old Ruins. Use the Old Ruins Waypoint. Talk to Captain Rumford in New Tristram. The Fallen Star quest begins with Captain Rumford who is battling zombies outside the gates to New Tristram. Once the quest is accepted more zombies will appear. After they are dead the captain orders the guard to open the gates so you may enter New Tristram. There is an opportunity to earn an Achievement here. Kill all the Zombies within 15 seconds and earn 10 achievement points and the achievement Gate Crasher. As a new character, this achievement is impossible. Find The Slaughtered Calf Inn and Leah inside. As you are talking to her the wounded in the bar turn into zombies. Speak with her again after you have dealt with them and she'll direct you back to Captain Rumford. Return to the town gates, right past the indefatigable Mr. Meat Wagon. A barricade near the captain will be broken down by some Risen who have been spawned by a Wretched Mother. The Wretched Mother is capable of spawning more zombies from her puddle of continuous vomit, but neither the mother nor her children are very dangerous. Killing her will net the player a bestiary entry, and an update to the quest. Kill them for the captain and he'll ask you to carry on along the path to The Old Ruins to more zombies and their Queen. You'll encounter Walking Corpses and more Risen here. None should present any problems. 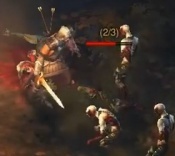 When you get to the more open area of the Old Tristram Road you should see red markers on the mini map when you are close by the Wretched Mother. You need to find three of these. Once they're found and killed carry on along the road to The Old Ruins and seek out the Wretched Queen. The Ruins have Quill Fiend, Risen, Walking Corpses and of course the Queen. Much like the Wretched Mothers, she is able to vomit up zombies, the difference being that she has more hitpoints and is able to summon the zombies a bit faster than the mothers can. Take the Waypoint back to New Tristram and speak with Captain Rumford again. Speaking to Leah will activate The Legacy of Cain quest. This page was last edited on 21 April 2015, at 22:31.